Carrot Taboulleh — yeeees CARROT taboulleh. Not just the crunchy stems, but the greens as well. 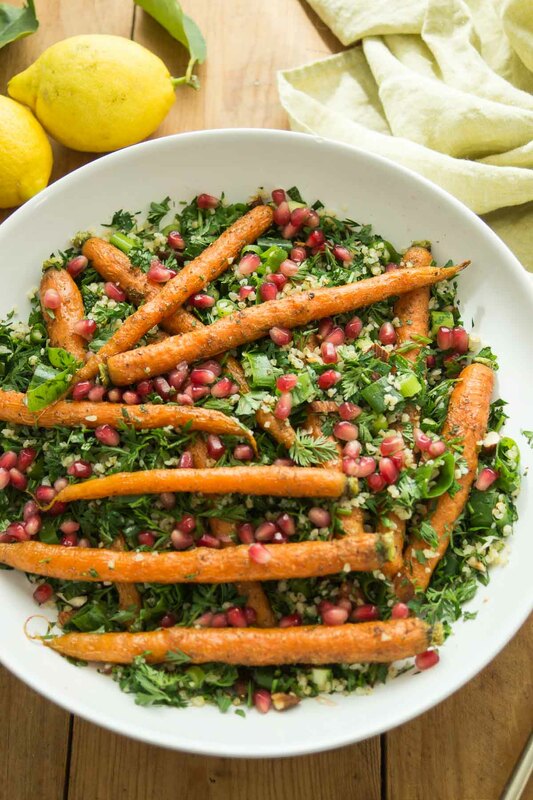 This take on the the wonderfully fresh and light Lebanese parsley salad is made with roasted cumin-carrots, toasted almonds and loads of green goodness from carrot tops, parsley, and mint. All tossed together with bulgur and finished off with a little olive oil and sunshiny lemon. Pomegranates give it a pop of color and delightfully tart/sweet and refreshing flavor. This is a salad that will make your heart sing! Serve it as a light lunch or with grilled meat, fish, halloumi, or even falafels and tahini sauce. 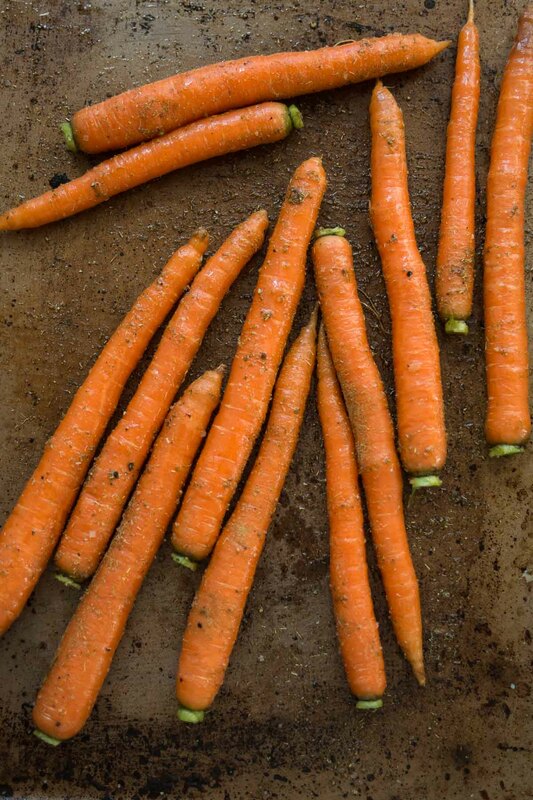 This may come as a surprise, but those green tops on your carrots are edible. Just like beet greens, radish greens and celery greens. All super delicious and loaded with nutrients! I would say that carrot greens have a herbaceous flavor that is vaguely reminiscent of, well, carrots! With a fresh parsley finish. I have heard that some people they can be described as tasting slightly bitter. Not like arugula bitter, but maybe something like baby arugula. To be honest, I didn’t even notice. But let’s not shy away from bitter greens. In addition to being nutritious, bitter greens are exceptionally beneficial for digestion and contain liver-boosting nutrients such as sulfur, along with fat-soluble vitamins (A, D, E, and K). So what about that rumur that carrot tops are poisonous? Yes, it has been rumored that carrot tops are poisonous, I did a little research and that’s actually not true. It’s true that carrot tops do have alkaloids, the supposed posion bearing villian, but actually alkaloids are a substance found in loads of leafy green vegetable and vegetables in the nightshade family: eggplant, bell peppers, tomatoes, and potatoes, which are all perfectly safe and part of a nutritious diet. 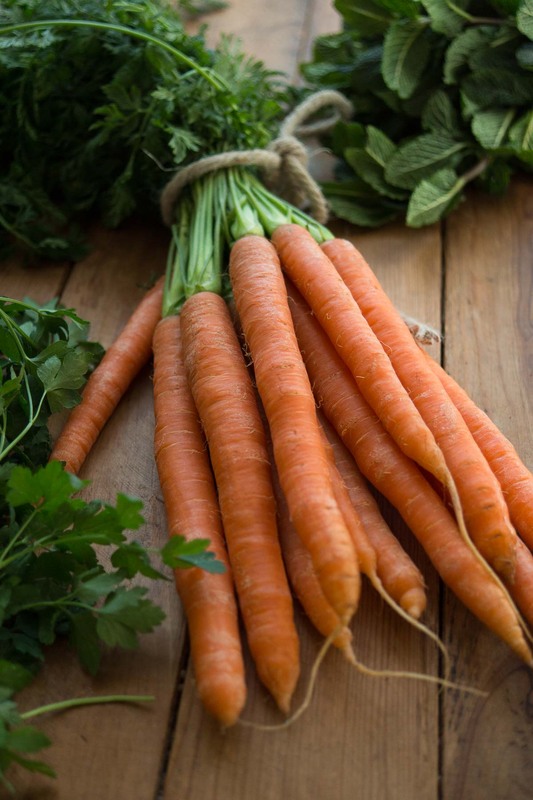 What can you do with carrot greens now that you know they are edible? 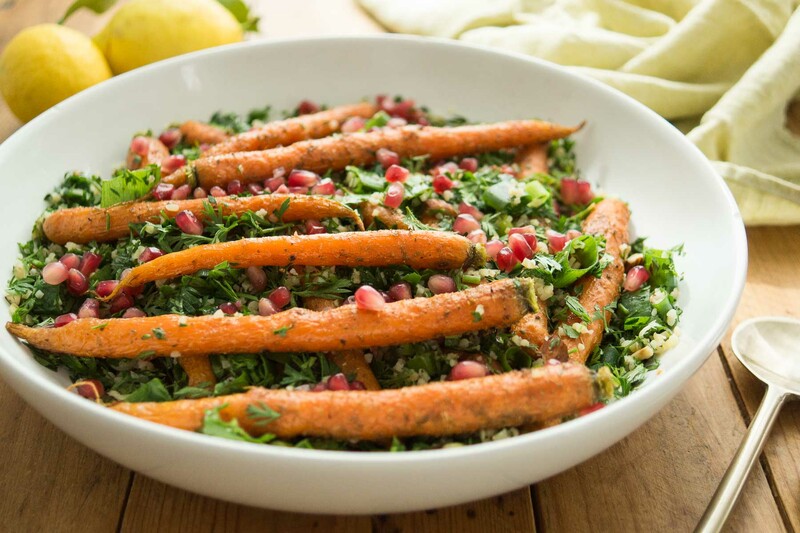 Think beyond carrot tabbouleh! Carrot tops can be sautéed in a pan with some of your other favorite vegetables. Apropos…sautéeing them or blanching them also takes off any bitter edge. You can also cook them into a soup or stew. Bottom line: they are tasty and nutritious and you shouldn’t waste them. 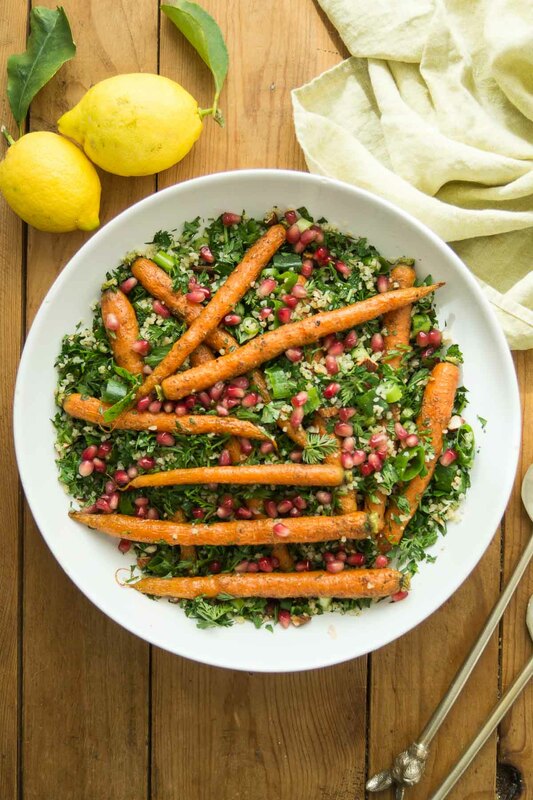 This version of classic tabbouleh is packed with spring and summer favorites like roasted carrots, carrot tops and lots of herbs. Almonds give it some crunch and pomegranates complementary sweet-tartness. Perfect for a light lunch or vegetarian and vegan side dish. Preheat the oven to 350° F / 180°C. 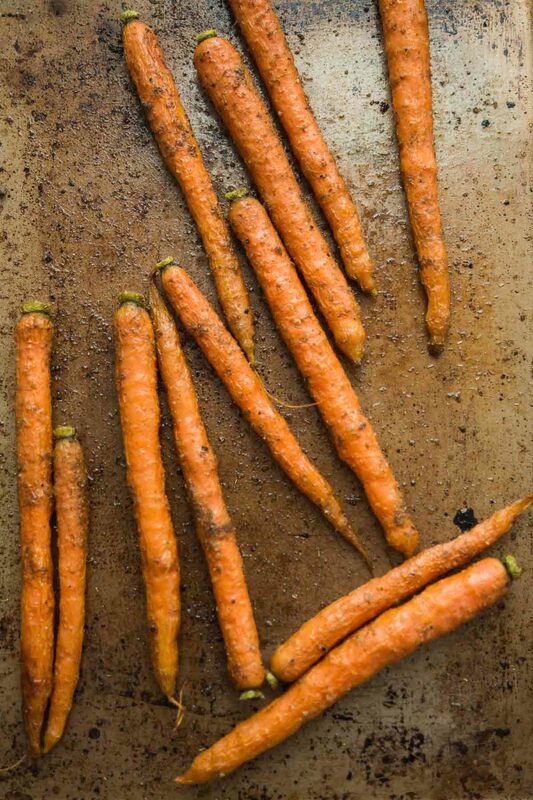 Place the carrots on a baking sheet and drizzle with oil and season with cumin, salt and pepper. Toss to evenly coat. Roast for 30-40 minutes, until tender, giving the pan a shake halfway through. Meanwhile, prepare the bulgur (according to package instructions). Cook in a 2:1 ratio water to bulgur. Bring it to a boil. Cover, reduce heat, and simmer for 10 minutes or until tender. Drain, if necessary. Transfer to a large bowl to cool. Toss the remaining ingredients with the bulgur. Taste the tabbouleh, and add more salt, olive oil or more lemon juice to taste. Top with roasted carrots, garnish with pomengranate seeds and serve. Enjoy! If you make this Cumin-Roasted Carrot Tabbouleh recipe, I’d love to hear how it turned out for you! Be sure to rate it and leave a comment below to let me know! Especially if you have tips for other readers. Or take a picture and tag me on Instagram @ellerepublic and don’t foget to hashtag #ellerepublic so I don’t miss it!